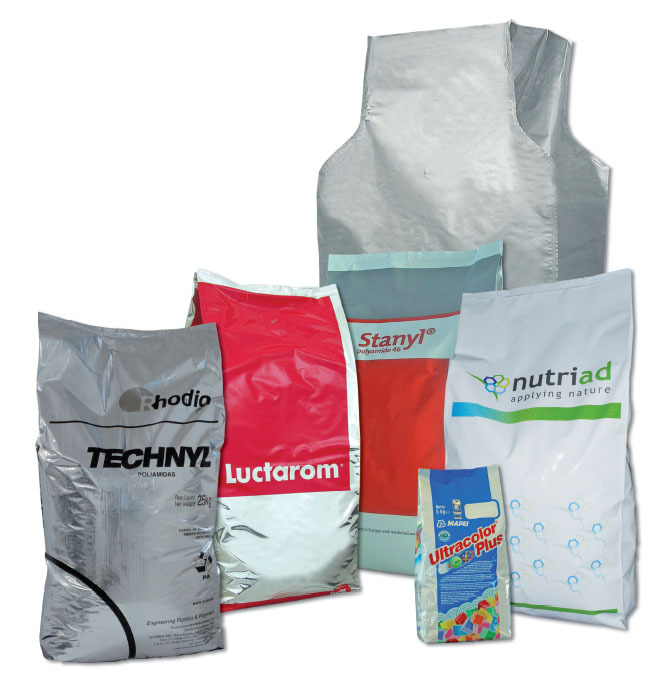 Industrial packaging: bags for granular product of 25, 500 and 1000 kg weight. High mechanical strength and barrier to preserve the product from oxygen and moisture coming through. 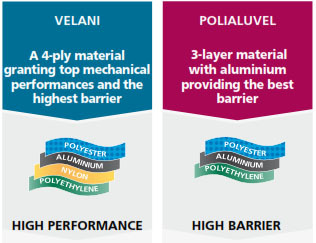 VELANI, FLEXI-AL, POLIVEL.2 with inner liner and POLIVEL.2 are just some of the different structures developed by Goglio to completely satisfy all the different needs of the market. These materials can grant to our customers the best barrier against oxygen and moisture and the top mechanical performances available on the market. These laminates also allow to get advantages as far as recycling and price are concerned. All Goglio’s industrial bags can be equipped with the patented HI FLO™ degassing valve. This one-way valve was developed to grant the best palletization in the shortest possible time, besides preserving the product from air coming through. The HI FLO™ one-way valve developed by Goglio is specifically conceived for industrial bags. inside the bag to come out during palletization in order to decrease the occupied volume, reach a stable shape and, moreover, avoid moisture to get in touch with the content of bags. The valve is heat-sealed to the bag and it begins working when the pressure inside reaches 4 mbar. Used to pack hygroscopic products like Evoh, PA compounds and XLPE, it grants the best mechanical and barrier properties. 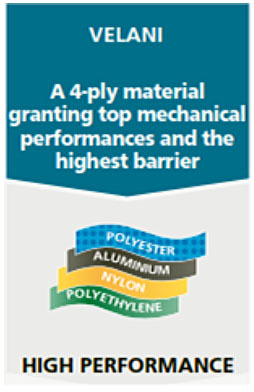 This 4-ply material with nylon and aluminium guarantees the longest shelf-life of every product in every situation and the top mechanical properties to face handling conditions. A 4-ply material granting the same shelf-life as VELANI, but with a lighter structure, environmentally friendly. It prevents the product from damages caused by moisture and oxygen. Mechanical performances are optimal for every kind of handling. FLEXI-AL: the perfect compromise between price and quality. 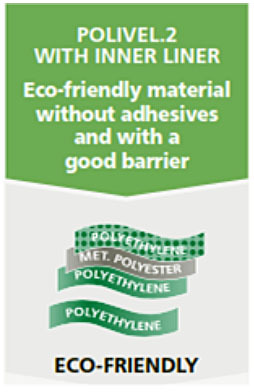 A laminate with metallized Polyester that provides a good barrier against moisture and oxygen. It’s used to pack sensitive products and grants a long shelf-life. The double Polyethylene and the inner liner guarantee good mechanical resistance. A brand-new and ecofriendly laminate. A metallized laminate, providing good barrier against moisture and oxygen. 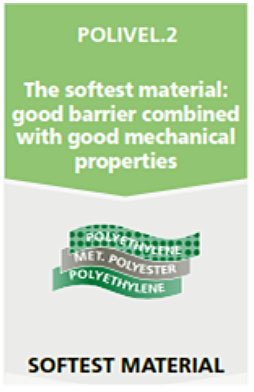 The softest and lightest material, eco-friendly, which adapts itself to the product granting more resistance to drop tests. It combines good mechanical properties and fair barrier with an attractive price. Liners from 500 to 1000 kg. All the liners (gusset and flat) are suitable for most common cardboard OCTABIN and FIBC to pack hygroscopic products. Best barrier properties against moisture and oxygen. It is used to pack hygroscopic products (ex. PA, EVOH, etc.). 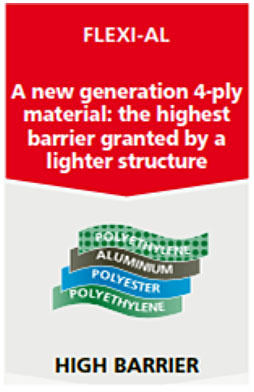 This 4-layer structure with aluminium foil and nylon layer can be used as inner liner for FIBC and OCTABIN preserving the content. It is used to pack hygroscopic products (ex. PA, etc.). This 3-layer structure with aluminium foil can be used as inner liner for OCTABIN preserving the content. Leader in flexible packaging systems and with Headquarters in Italy, Goglio has facilities and sale/service offices in Europe, in America and in Asia. The trademark Fres-co System® identifies the strategy integrating all packaging requirements to solve customers’ needs: high barrier, multi-layer laminates, packaging lines, moulded plastic accessories such as spouts and valves, and customer service. Goglio, with a long experience in flexible packaging, has developed a complete range of high barrier bags suitable for industrial purposes. 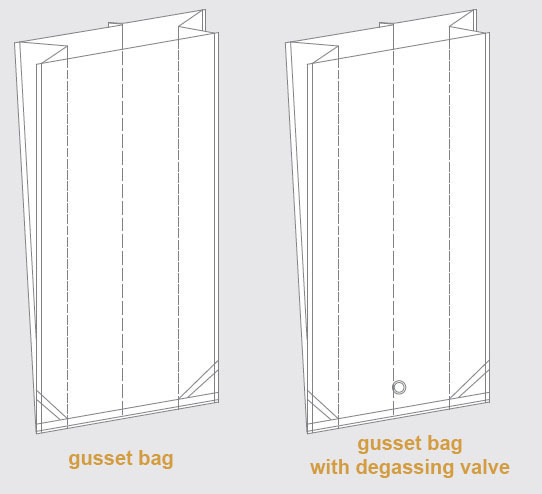 Moreover, thanks to the flexibility in our production plants, we can supply standard shapes like flat pouches and gusset bags, or we can study tailor-made sizes according to customers' needs.